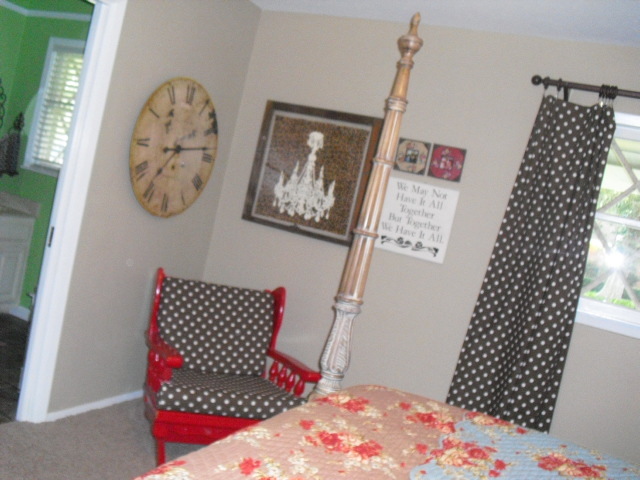 In April I did a mini makeover to my master bedroom. It took me a while to get the rocking chair painted, but it's done now. Thanks to my husband. I spray painted for about 2 seconds and gave up. I also recently got this cute little chandelier from Golightly's. This is the chair before the makeover. Not sure why all my words want to be underlined. I guess blogger thinks what I am typing right now is really important? I like it a lot better white. I am learning that with a baby, projects have to be done a little at a time. That's hard for me. When I get an idea in my head, I want it done RIGHT NOW! Now the "How To" for Katie's yarn and felt wreath. It should be wreathes, but I still haven't finished the second one yet! I got the plans for the wreath at Felt So Cute. Just wrap your wreath with yarn. It took longer then I thought it would and it made me DiZzY! I was brave and finished the job! I did a smaller version then the Felt So Cute blog and I used a straw wreath instead of a foam one. It was a third of the price. If you use straw then be sure to leave the plastic on it. Unless you want to look like you live in a barn! I got everything at Hobby Lobby. They have small felt rectangles in the craft section that are 4 for $1. You can get 2 or 3 flowers out of one piece. I love how it turned out. It just cost $10 total for 2 wreathes. The yarn was donated from my mom though. So just add maybe $6 for that. Unless you know my mom and she might hook you up! I might make a couple more for my living room. Maybe I will take some Dramamine first! So very cute! The wreaths would super adorable to valentines day. Is it wrong that I'm already planning my fall decor? I am SO over summer. I love the bedding and the mix match pillows. What is on top (the white)? Just a blanket? Hi there, I absolutely love your home! I could only wish I could get mine to look as half as cute. I found your blog on Kelly's Corner. I grew up in Grapevine, small world. A few posts back you wrote that your husband made you an adorable awning for over your sink. Is there anyway you could tell me how he made this. I would love to do the same in my home. Blessings! It is awesome work. Well, I found your blog on Kelly's Corner. It is wonderful decoration of home as well as beautiful work you done here. It helps me lot for my new home. It is best to keep in home entrance on Christmas days. I really like that combination of red and white color. Well, those roses collection is awesome and really gorgeous. Those night lamp without cover is such a excellent and wonderful to keep in home entrance. I am newest follower of your blog and enjoyed lot.